1 A None No Power Seat 1 A is a standard Business class seat that may have restricted legroom due to the bulkhead. 1 B None No Power Seat 1 B is a standard Business class seat that may have restricted legroom due to the bulkhead. 1 H None No Power Seat 1 H is a standard Business class seat that may have restricted legroom due to the bulkhead. 1 J None No Power Seat 1 J is a standard Business class seat that may have restricted legroom due to the bulkhead. 10 A None No Power Seat 10 A is a standard Economy Class seat that has extra legroom due to the exit however, this seat also has limited to no recline due to the exit row behind. 10 B None No Power Seat 10 B is a standard Economy Class seat that has extra legroom due to the exit however, this seat also has limited to no recline due to the exit row behind. 10 C None No Power Seat 10 C is a standard Economy Class seat that has extra legroom due to the exit however, this seat also has limited to no recline due to the exit row behind. 10 G None No Power Seat 10 G is a standard Economy Class seat that has extra legroom due to the exit however, this seat also has limited to no recline due to the exit row behind. 10 H None No Power Seat 10 H is a standard Economy Class seat that has extra legroom due to the exit however, this seat also has limited to no recline due to the exit row behind. 10 J None No Power Seat 10 J is a standard Economy Class seat that has extra legroom due to the exit however, this seat also has limited to no recline due to the exit row behind. 11 G None No Power Seat 11 G is a standard Economy Class seat that has extra legroom due to the exit. 11 H None No Power Seat 11 H is a standard Economy Class seat that has extra legroom due to the exit. 11 J None No Power Seat 11 J is a standard Economy Class seat that has extra legroom due to the exit. 26 A None No Power Seat 26 A is a standard Economy Class seat in the last row of the plane. This seat does not recline and the close proximity to the lavatories and galley may be bothersome. 26 B None No Power Seat 26 B is a standard Economy Class seat in the last row of the plane. This seat does not recline and the close proximity to the lavatories and galley may be bothersome. 26 C None No Power Seat 26 C is a standard Economy Class seat in the last row of the plane. This seat does not recline and the close proximity to the lavatories and galley may be bothersome. 26 G None No Power Seat 26 G is a standard Economy Class seat in the last row of the plane. This seat does not recline and the close proximity to the lavatories and galley may be bothersome. 26 H None No Power Seat 26 H is a standard Economy Class seat in the last row of the plane. This seat does not recline and the close proximity to the lavatories and galley may be bothersome. 26 J None No Power Seat 26 J is a standard Economy Class seat in the last row of the plane. This seat does not recline and the close proximity to the lavatories and galley may be bothersome. 7 A None No Power Seat 7 A is a standard Economy class seat that may have restricted legroom due to the position of the bulkhead. 7 B None No Power Seat 7 B is a standard Economy class seat that may have restricted legroom due to the position of the bulkhead. 7 C None No Power Seat 7 C is a standard Economy class seat that may have restricted legroom due to the position of the bulkhead. 7 G None No Power Seat 7 G is a standard Economy class seat that may have restricted legroom due to the position of the bulkhead. 7 H None No Power Seat 7 H is a standard Economy class seat that may have restricted legroom due to the position of the bulkhead. 7 J None No Power Seat 7 J is a standard Economy class seat that may have restricted legroom due to the position of the bulkhead. 9 G None No Power Seat 9 G is a standard Economy Class seat that has limited recline due to the exit row behind. 9 H None No Power Seat 9 H is a standard Economy Class seat that has limited recline due to the exit row behind. 9 J None No Power Seat 9 J is a standard Economy Class seat that has limited recline due to the exit row behind. 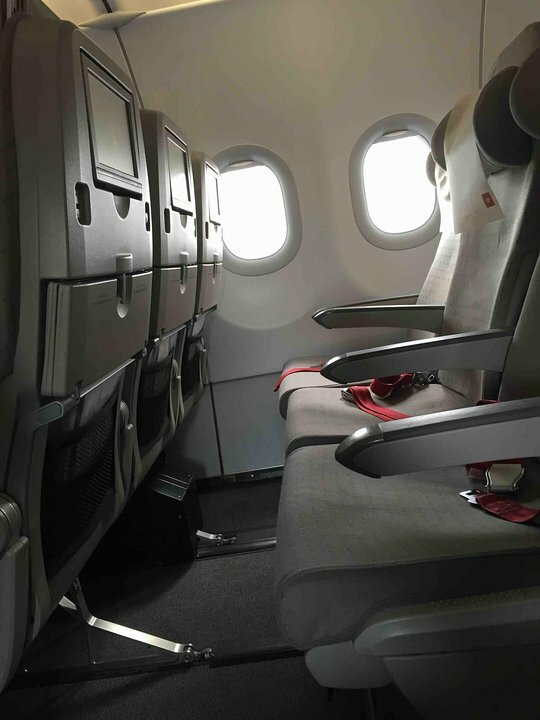 Royal Jordanian flies their version of Airbus A320 in a two class configuration with 16 Business Class recliner seats and 120 standard Economy Class seats. On my flight, the extra legroom on this specific exit-row is minimal. But no need to worry - overall the legroom in Eco wasn't bad at all. I am 1,87m and I had still a little room to move my legs. After a lot of humilation travelling Eco you get thankful for each cm. There is a media-box under each seat on every row (except frontrow) though, restricting the room under the seat. Food was average, service good. Royal Jordanian flies 1 versions of Airbus A320.